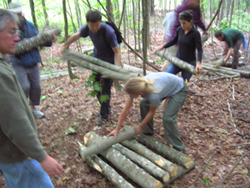 "Permaculture Student Testimonials | Center for BioRegional Living NYC." -- He is an important messenger for the new beginning and I will consider him a mentor. -- Legend! A highly educational, empowering, earthy experience. One in which the main focus was learning how it is possible to live a simpler and more harmonious lifestyle. Thanks for being legends. -- Explore your area of interest . . . in a highly supportive and informed environment. -- While learning about these concepts you get to live with folks who are designing their lives founded in these values. Great role models! -- The connection between the humans and the land. Andrew very plainly and clearly represented some very basic concepts that made a major impact on me because I never looked at the human species as anything other than the dominant species rather than one of many. -- Hike, swim and meet all the wonderful people in the area. -- I got the pleasure of visiting other homesteads and communities to compare different styles and approaches one might take. This class drastically changed the way I think about and observe the world and its problems and has made me think about positive things I can do to improve its condition. -- I really liked the fact that we could start a class talking about super fund toxic waste sites and somehow end up talking about what we think god is. -- I really appreciated the focus on this bioregion Other permaculture courses tend to use too many foreign examples. 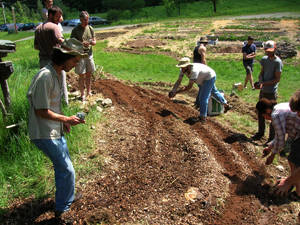 I loved the melding of biodynamics and permaculture. -- I feel I explored and was introduced to many areas and issues I previously didnt realize existed. 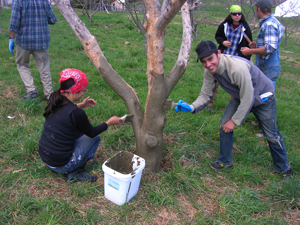 Copyright © 2013 Center for BioRegional Living - All rights reserved.